I went to the surgeon this morning for a follow-up visit. Seems my appendix had a benign polyp attached to it and she is all gung ho about me getting a colonoscopy. I signed up for one on March 4th. I feel I still need time to get over this pneumonia and feel stronger. I’m also getting an endoscopy as sometimes I had swallowing issues, which may be from stress, but better to get that checked out. The same surgeon will do the procedures, so I’ll be in good hands. She was kind enough to give me a prescription for a yeast infection as she didn’t even prescribe the medicine that bothered me. It was one pill-$15! Better be like magic. 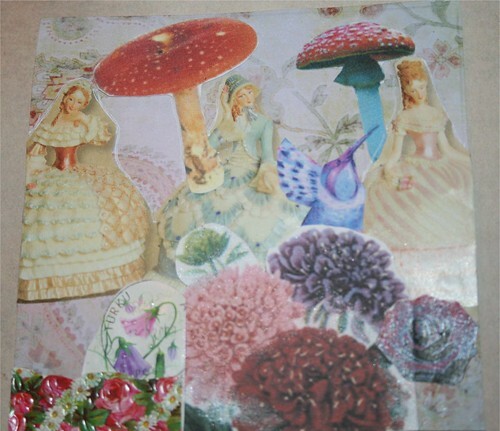 Here’s a card I made a few weeks ago called ‘Belles in Mushroomland’. It’s made from mostly scraps, more so then some of my cards. I have to get working on those 4″ x 4″ collages again. I guess my personal challenge will extend to September now. Wishing you all the best with your continuing medical issues, Dianne! I bet you are eager to drink that delicious prepatory beverage for your March 4 test. I don’t envy you. I hope all goes well! Your surgeon will inject some numbing medicine into the area that will be treated so that you do not feel pain.